"We do this work to tell stories and I'm blessed to have this big global platform in ABS-CBN," says Steve Angeles, rising ABS-CBN reporter based in Los Angeles, California. Some of you may know him through his reports seen on ANC and TFC, where he is one of its most prominent on-air news talents along with news heavyweights Gel Santos-Relos, Yong Chavez, Don Tagala, Bev Llorente, and many others. We decided to feature Steve for this edition of MNP Q&A for many different reasons. One is because we know Steve is a "reporter at heart," and that is evident on his unbiased and fair reporting. The other is because he's a good representation of the ABS-CBN International reporters who are known for being jacks of all trades: they write, edit and shoot their own reports -- a rare practice and training in the news business nowadays. We caught up with Steve to discuss his career as a journalist, the two newsers who served as his mentors, and his well-documented weight lost battle, among others. Hi Steve! How's life in the U.S.? It's surprisingly quiet right now. I was a panelist for an ethnic media presentation at the Orange County Register so it's also refreshing to know that more and more American mainstream media are recognizing the diversity of the community and the journalists that cover these often under represented minorities. We've also launched an ABS-CBN office in Glendale, California, just outside of Los Angeles. Aside from that, my golden retriever puppy looks like he's getting bigger everyday and it's kind of freaking me out. 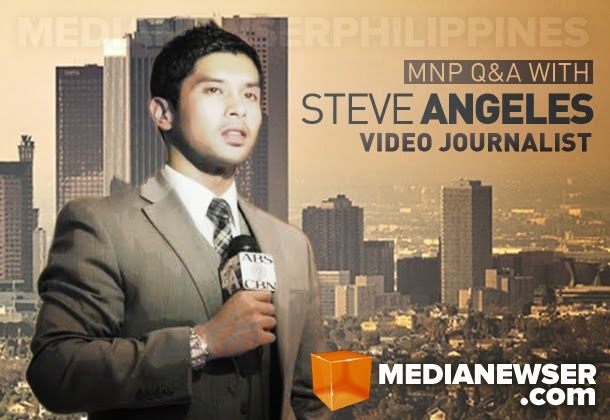 To some of our Filipino readers who aren't that much familiar with ABS-CBN International reporters, who is Steve Angeles? Did you always dream of working in the news business? Not necessarily news, but I definitely wanted to work in television from a young age. My parents worked in media so it was a natural choice to do something TV related, but I didn't go into journalism until I started at ABS-CBN. I've always liked telling stories. I found old videos of me, pretending to be a newscaster. I guess inside it's always been there. My childhood obsession with comic books (remember Superman and Spider-Man were both journalists) may have subliminally had a role with that. While journalism was originally part of my learning experience, I realized it's something I'm passionate about and had a natural gravitation towards. Part of it is knowing the power and importance of the news and how it affects people. Could you tell us something about your early beginnings working in the business. Aside from home video of 5-year old me pretending to be a newscaster, it got serious for me in high school when I was part of the audio visual club producing video presentations and a video yearbook in high school. I was lucky enough to know what I wanted to be when I grew up so I went to school and did a few internships. I met some FilAms in college that introduced me to the ABS-CBN's North America office and I've been here since. Odette Alcazaran was our original executive producer and was the first to take me under her wing and my first story was actually a Filipino girl who was a champion dog show handler. ABS-CBN International reporters are known for being multitaskers: writer, producer, videographer, reporter in one. How would you describe your training and experience with TFC/ABS-CBN so far? I came in at the right time as an eager intern and we were a small office in Burlingame. Balitang America was filmed in a closet turned studio and we were able to get a lot of hands on training in all aspects of production. The office is very tight knit here, so news, production and creative were all under one department and everyone was supportive of each others growth. A lot of ABS-CBN North America is homegrown especially in the past 12 years. From interns to full timers, we all had chances to experiment with our talents. Upon graduation, I was originally hired as an editor but was also allowed to contribute to the newscast, while also working with other shows. As the office expanded, we all decided that I would excel the most in news and current affairs. I assume with ABS-CBN International you can pitch your own stories, right? Of course news comes from ground level and from all directions like a compass (North East West South) So I have to keep an eye out for Filipinos making news out here as well as how local news and issues out here affect Filipinos. What types of stories do you like to cover and why? Court cases. While I have a sports background, and entertainment is fun, they get too predictable. Crime is always intriguing. Whether it's a local story on a Filipino killing someone, or a multilevel international conspiracy, these complex cases are full of surprises, with many twists and turns. And as a reporter it's my job to dig for the answers. Social movements are great to cover. It's amazing to have a front row seat when witnessing history. My favorite reporter to watch is Anderson Cooper, his narratives are compelling and he can dissect an issue from so many angles. I grew up in San Francisco and us Filipinos were lucky to have Lloyd Lacuesta on mainstream, at a time when Filipinos were under represented. I've always thought Cher Calvin was a great symbol for FilAms that go home, work for ABS-CBN and come back to take on mainstream. I look up to a lot of the ABS-CBN reporters in Manila. American coverage is safe compared to some of the things they deal with like storms, dead bodies, and kidnappings. Who are your friends in the business? I was originally a production guy so in my mind I'm still one of them. Jeremiah Ysip is our resident Emmy winning videographer and was the one who originally recruited me. I'm very close to the folks back in Redwood City. I've had good working relationships with a lot of the Manila people and had a good experience hanging out with them when I went to visit. Our New York correspondent Don Tagala is the only other person with the same job description as me, and I've had the chance to spend a month with him in New York, we're like distant long lost brothers. Since I work alone in Los Angeles, and I'm concentrated on Filipino news, I've made lots of friends in the FilAm media especially from the likes of Asian Journal and Pacific Rim. How would you describe Ging Reyes and Nadia Trinidad? Great mentors. I would admit that I owe my life to them. Ging gave me the break and continued support. It was her idea to throw me in LA. After she left to become Senior Vice President, Nadia came in and mentored me through some of my darker days as a list journalist. I'm honored that I've worked closely with them and they've always kept faith in me. They're good at recognizing talent and potential and investing in it. Even from afar, they're continuing to push and challenge me. And speaking of Nadia, since she's the new ANC head, will you be open to the idea of working here in Manila? I'm sure Nadia and Ging would be delighted to have you here. The beauty of this job is I can do it anywhere and I'd love to work in Manila one day. I've had a chance to shadow around there and it's exciting. But for now my role is Los Angeles and I take pride in being one of the few Filipino media men out here. You've been doing this for years and I'm sure you know the ins and outs of the biz. But do you still get nervous in front of the camera? It's not as bad considering I'm my own cameraman so I'm just staring at a tripod for the most part, but when I do the occasional shoot at the studio I do get jittery. The live Skype can get nerve racking especially when my mind is also on technical issues when we do those. This is actually the most challenging question. I've always treated everyone, whether it's a man on the street sound byte or a high profile interview as "just another assignment" that mindset has helped keep me objective, while I notice it makes the ordinary person to feel special, but can also make a celebrity feel more personable. I've had my fare share of celebrities, but I also like to factor in "degree of difficulty" and most celebs are accessible. It would be cool though to find Jeane Napoles, and get to the bottom of the pork barrel. Your weight loss is very well-documented. What was the ultimate reason why you decided to shed weight? It was part dare, part scare. A friend dared me to try to become one of those people crying in the workout video infomercials, and the doctor told me I was in pretty bad health. By then I was done with American football, and I didn't need that extra weight. I decided to take on the challenge and never thought I'd get this far. Ironically, I've gone too far and have been ordered to gain back some weight. What has been the biggest change for you as a result of your weight loss? Healthy body leads to a healthy brain and healthier functions. It's helped me cope with the demands of this job. The aesthetics were a bonus, it's flattering when I get compliments, so the confidence is a plus. Sadly, the world is still aesthetic-based, if you're not eye candy, you need personality. I think I still have the charm of a bubbly "fat kid" so it actually works out even better nowadays. What's the best and worst thing about working in TV news? The best part is believing some of your observations and fact gathering can make an impact to an under served community that's hungry for information. We do this work to tell stories and I'm blessed to have this big global platform in ABS-CBN. Plus the fact we use video to tell our stories, it gives a chance to be creative. Worst part is when you're in my position in a high profile company, you're exposed to some of the negative aspects to the community you cover. Sadly Filipinos here aren't completely united, there is a lot of using each other, dishonesty, backstabbing. How do you manage your own personal life with a pretty busy schedule? I realized when you put God first, everything else falls into place. It gives a peace of mind and allows you to organize your personal life. It also helps me understand my role in this news world. Journalism is a lifestyle, it happens at any time and any place and in my case it happens in two countries. It helps when you have a set of friends that do not care at all about your work, but they understand the importance of your work. What do you think viewers should know about you? I guess to finally set the record straight to the most asked question I get which is "how do you film yourself if you're alone?" The answer is a 20 pound tripod, or if I'm too tired to carry it around, I have a buddy hold it or I get creative and stack my camera on mailboxes, garbage cans, phone booths, etc. It's 90% writing. All the on-cam stuff is just extra. I see a lot of pretty faces that think broadcasting is looking pretty and asking questions even if it doesn't make sense at times. Content is and will always be the king so to achieve that content, there needs to be an efficient balance in accuracy, timeliness and execution. It takes attitude and thick skin as well. I've seen interns crumble. People need to be ready for criticism from the public, colleagues, and bosses. Aspiring journalist need to be willing to grow and to some degree compete. We'll get rejected, we'll lose sleep, and maybe even lose friends but in the end it's a calling and our work is to serve the greater good. An open mind helps a long way, whether it's being open to the news stories, or the industry itself, you've got to think outside the box. I've only been here 9 years, and that was before twitter, so this industry continues to evolve quickly in so many aspects.